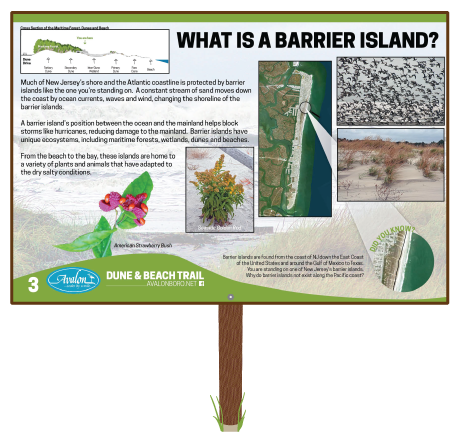 Avalon Dune and Beach Trail - What is a Barrier Island? A barrier island is a landform typically consisting of long, narrow deposits of sand that run parallel to the coastline. The islands are usually arranged in chains with inlets separating them. The inlets connect bodies of water, such as bays, rivers, and intracoastal waterways to the ocean. 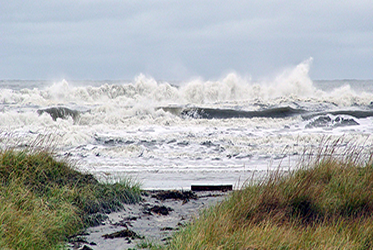 Barrier islands are shaped by tidal forces, currents, wave energies and sediment. These processes make up the dynamic equilibrium of a barrier island system and are constantly reforming and changing. 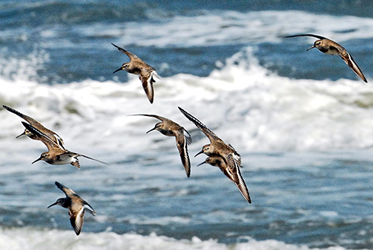 They are typically made up of four separate habitat zones: salt marsh, maritime forest, dunes, and the beach. Salt marshes are shallow areas on the mainland side of barrier islands that are inundated daily by tides and consist mostly of cord grasses like spartina. Before Avalon was developed, the majority of the island was covered by a maritime forest. Trees, shrubs and vines especially adapted to sand, salt spray and windy conditions make up this woodland. 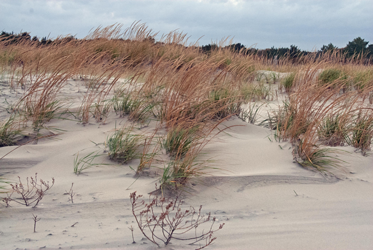 Dunes, which are the rolling hills behind the beach, are created by windblown sand being naturally stabilized by plants. On the beach, wave action and salt water spray keep many plants from growing and surviving. 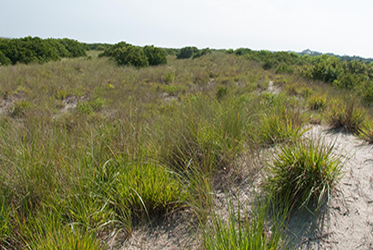 Barrier islands are unique, valuable natural resources that contain sensitive ecosystems, recreational areas, and economic opportunities. It is estimated that there are 295 major barrier islands from Maine to Texas. 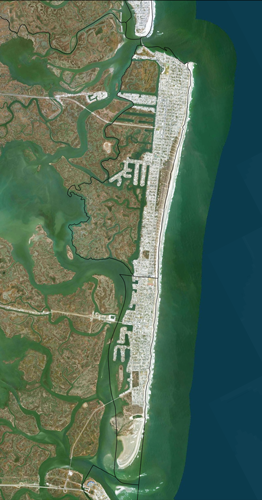 Many barrier islands grow larger over time, while others grow smaller. A barrier island like The Seven Mile Beach is constantly changing as a result of both natural and human influence. Wave and wind actions are constantly moving sand around on the beach. Changes to the size and shape of a barrier island depends on the tidal range, wave energy and near shore currents of the region. Sandbars are typically formed by the rise and fall of the tides and develop in the inlets between barrier islands. The barrier island system that runs along much of the Atlantic Coast protects the mainland from severe storms and hurricanes. There’s a lot more to be learned about barrier islands. Let your education begin here.